The research project presented in this work focused on the meeting and cooperation of special school (education for pupils with learning disabilities) and the compulsory school in Sweden. Participants were pupil assistants, recreation instructors, compulsory school teachers, headmasters and special-needs teachers educated for pupils with disabilities. One of the project's aims was to identify the factors connected to goal fulfilment in an integrated activity. From the data generated by the project, in project meetings and in interviews, an area-related theory named "positive branding" was tested. Positive branding refers to the attitudes and measures which strengthen the position and status of the integrated children. The reasons why special needs school and compulsory school traditions sometimes clash is discussed. The "special pedagogical contradiction" and the two different directions, "the narrow" and "the wide" activity, which have been evident in the project documentation, are also discussed. Lastly, some comprehensive measures are presented which could create favourable conditions in a school that includes, rather than excludes, its special-needs students. The results show that the most important factor in integration work is the adults' attitudes and values. Therefore it is important to concentrate on education, development work, research, conferences and networking. It would also give positive signals to reward and encourage schools that work purposefully with integration issues. Since 1994, education for pupils with learning disabilities has followed the same curriculum as the compulsory school, meaning that all pupils, regardless of the type of education, are embraced by the various aspects conveyed in the school's fundamental values and mission (Skolverket, 2001b.). The same curriculum also includes the special knowledge goals required for the various types of school. Goals that reflect what pupils in the special school must achieve at the very least when they leave those schools differ in a decisive way from the goals to be achieved in the compulsory school. The goals express what the pupils, each according to his or her abilities, are to have achieved when they finish the special school (a.a.). Even though the two forms of school have a common curriculum, the learning-disabled children are often separated from the others upon starting school. After having been included in integrated groups in pre-school, the vast majority of children with learning disabilities are placed in segregated classes. The special form of school that was once established for retarded children, called special school, still predominates. The obligatory special school, which is nine years with the option of a tenth, is divided into two levels, the compulsory education for pupils with learning disabilities and the education for children with severe learning disabilities. When a pupil who has been accepted by the special school receives his or her education in a regular compulsory school class, while retaining the syllabi of the special school, this should be considered as individual integration (Skolverket, 2001a). Many times the definition of individual integration refers to the pupil being placed in the compulsory school located in his or her neighbourhood. There is no absolute measure of how many hours of the school day the child spends with pupils following the compulsory school's syllabus for the definition of individual integration to be valid. In some school districts, individual integration is defined as a pupil admitted into a special school where he or she spends at least half-time together with compulsory school pupils, yet follows the syllabus of the special school. Special school pupils may be integrated in some subjects, but be placed in smaller teaching groups in others. However, it is evident that the official view in the last century has been to strengthen the encounter between special school and compulsory school children, even though this may not always make a clear impact on the activitities. In the following study, the concepts of "broad" and "narrow" activities are introduced. In the broad activitives the integration is much more accentuated than in the narrow ones. This will be discussed further on in the article. Being integrated and integration are two concepts that since the early 1970s have been used to describe the circumstances of and relationships between handicapped and non-handicapped pupils. As the concepts occur in different contexts, each with a different import, the meaning of the concepts has been somewhat unclear. A number of writers have argued for differentiating and refining the terms, and for distinguishing different forms and levels of being integrated (Asmervik, 1976; Dalen, 1977; Wolfensberger, 1972; Emanuelsson, 1996). To distinguish a more superficial form of integration from a more thoroughgoing and meaningful integration, a number of different definitions have been presented (Soder, 1980). The division into four different levels, viz. physical, functional, social and societal integration is no doubt the most frequently referred to. The concepts have often functioned as the point of departure for evaluating and analyzing activities that have the goal of accommodating all of the pupils. Another way to nuance the concept of integration is to use the terms segregative and inclusive (Haug, 1998). Central to segregated integration is to find the best possible environment for the individual pupil. The education focuses on subject-oriented learning and achievement. Difficulties are identified as medical or psychological injuries or insufficient development. Segregative integration is the origin of special tuition, according to Haug (a.a.). The starting point of inclusive integration is that "education should occur within the framework of the class where the child is enrolled as a pupil." The reason for taking this position is the values grounded in social justice and the equal right to participation, (Haug, 1998. p. 23). In an inclusive outlook it is accepted that children are different and that "all are equal in respect to the school, and the school is equal in respect to all the pupils" is the guiding principle for the activities (a.a., p 24). The main idea of inclusive integration is that children and young people participate in the social community regardless of their qualifications, interests or capacity for attainment. A certain vagueness regarding the concepts being integrated and integration has given rise to a need to replace these with a new and not-so-encumbered concept. The term included could be an appropriate replacement. Integration of the individual as a process can be expressed as a continual meeting between the cultures of normal activities and special activities. In these two cultures there are forces varying in strength, which in relation to the common surface - the integrated activities - exert influence in different directions. For example, it may be that the compulsory school's outlook on achievement and/or the special school's culture of caring can result in a smaller scope for the integrated activities. The size of the scope in common, the integrated activities, thus expresses the effect of these forces. If the work toward integrated activities is to be successful, it is necessary that the personnel in both cultures, with the overall goals of the curriculum in mind, continually work to increase the integrated arena (Karlsudd, 2002). In this report I will focus on the relationships and factors that promote this process. Kalmar Municipality in Sweden started a project called "Together", which was conducted for three years. The project assembled participants from six schools with individually integrated children with special needs in their work. The project group of each school was represented by five participants, who in turn initiated and established the work in their respective schools. The goals of the project were, in collaboration with teachers and students of education, parents and school personnel, to identify the factors that are related to the attainment of the goals in integrated activities. In the project an action-research effort was applied, which can be described as an interactive process of change incorporating action, research, theory and practice, in which the researcher actively assists in the process. One could describe action research as a spiral of steps in which each step involves planning, action, observation and reflection. From the start of the project until its conclusion there was a continual documentation of this process (Starrin, 1993; Tiller, 1995). The action-research effort is by no means uniformly formulated, and different researchers emphasize different aspects. Different appellations are often used in an attempt to better define the effort. Argyris (1985) uses the term action science for the part of action research that is more theoretically oriented and action research for the practically-oriented part. Regardless of where the main emphasis lies in the manner of tackling the problem, there is a distinct common denominator for action research and that is doing research through action. The most common type of action research is when teachers work together with researchers (Cohen & Manion, 1994) often with the aim of increasing critical thinking and creating new issues (Feldman and Minstrell, 2000; Archer, Holly & Kasten, 2001. In Sweden is is increasingly common for teachers and researchers to join in the work of problematizing the encounter between theory and practice (Ronnerman, 2003). A condition for taking part in the project was that all participants had to represent an activity with the intention of giving priority to the integration of the special school with the compulsory school. The participating schools had reached different stages in their integration work. The sample included schools which had, prior to the project, carried out important changes in an integrative direction. The project comprised pupil assistants, leisure-time pedagogues, compulsory school teachers, school leaders and special needs teachers. Participation was altogether voluntary and evidently undertaken without any pressure from school management. The data in this investigation have for the most part been taken from the minutes and notes written down when the groups met for the project. In addition to this, 25 individual interviews have been carried out with those responsible for the project at the participating schools. The interviews were conducted individually at the participants' home schools and took approximately one hour. The interviewees were given an overarching introductory question: "What is the position of the activities in relation to the concepts of participation, normalization, integration and special support?" As a further support for these keywords a few brief quotations from curricula and the Educational Act were provided. Continuously throughout the development work researchers and investigators have visited the project and lectured on the subject of "a school for all". The lectures have been well attended, since they have also been open to an external audience. After each lecture the participants in the project have met with the lecturer to discuss the problem area and penetrate more deeply into the issues raised in the lecture. The lectures have been important ingredients in the project, the post-sessions in particular. To be able to follow up the lecture in a smaller group linking the discussions to one's one work has been been much appreciated. In the analysis of the results four clear categories emerged. The first was school organization and practical implementation. The second includes external factors and classmates' importance for the integration process. The third category deals with statements about the role of adults and their attitudes to individual integration. The fourth and last category concerns control instruments and the impact of school tradition. In the presentation of results and partly in the following discursive chapter the presentation follows the above categorization. The schools represented in the project have organized the individual integration in distinctly different ways. A common model is that the children belong to a compulsory school class and then spend part of the day in a small separate group. The period of time that the children with special needs spend in a small group can vary from a few hours a week to most of their time at school. It does happen that children from the compulsory school, it could be spontaneously or planned, participate in these groups, but this is rather unusual. Many teachers describe how they try to individualize the instruction in the classroom as much as possible, but the most common strategy when extra resources are allotted is to increase the number of group hours. In certain subject areas it is more common that real integration actually occurs. Subjects such as music, physical education and art are considered especially suitable for a successful meeting between children from the special school and children from the compulsory school. The special needs teacher does not usually participate in the instruction of these subjects. This teacher has most of his or her instruction in the subjects Swedish and math, and this must be seen as an indication that these subjects are given high priority in the education. It is also during these lessons the children with special needs are most noticeably apart. Before the start of every autumn term there are discussions and plans for children with special needs. It is not unusual for this planning to be characterized by instability and short-sighted solutions. Many times the school staff and personnel are not sure about the resources at their disposal for the coming term. The rotation of the personnel can also be considerable when it comes to teacher assistants and special needs teachers. Many are of the opinion that the economic situation is of vital importance for whether or not the integration will be successful. The money was rapidly integrated, but not the pupils. The home schools are probably meant to contribute more money than currently. External factors and classmates' importance for the integration process. At the small schools people are experts on adapting themselves. The teachers' work conditions vary in many ways, often without special needs teachers. The class teacher is closer to the special needs pupil and the parents. There are also some who think that schools that have a large number of immigrant children have a greater tolerance and action preparedness to work with children's differences. Here the boundaries of normalcy are not as narrow. A frequently debated issue is that there are too many pupils in every class, which has been taken up in other studies (Scruggs & Mastropieri, 1996). The school has too little space and many teachers want larger areas and more group rooms. The schools described are quite similar in design. The ordinary classrooms are not so different from one another. What do differ are the rooms used for the segregated and differentiated instruction (group and individual instruction). The rooms used for this purpose can vary from one year to the next. There are a number of different reasons why the rooms for this type of instruction vary. The attitudes of school heads and other teachers to special instruction apart play a decisive role. The importance of suitable and well-adapted rooms has been observed by most members of the project groups. Some rooms are not in a suitable location and not especially functional. Of decisive importance for which rooms are to be used is the argumentation presented by the teacher responsible for the children who are the focus of the instruction in special groups. There are instances where arguments based on the working environment of the employees carry more weight than arguments concerning the children's learning environment or possibilities of integration. The relationships to classmates are described as functioning well and the other children have a positive attitude toward encountering children with handicaps, but it can be difficult for children with intellectual disability to get a close friend. Children admitted to the special school are a pupil group that is frequently met by a more caring attitude and the adults often have a better insight into the activities of this group. All in all, this is probably the main reason why the participants in the project believe that bullying involving the children with intellectual disability is very unusual. It is more problematic to get together with friends of the same age during after-school hours or after the school-age child care. Something that continually recurs in the project documentation is the adult person's role and attitude toward individual integration. It is often pointed out in discussions and interviews how extremely important the adult world's positive attitudes are, which has been corroborated by many studies, for example, (Wilson, 1999; Emanuelsson, Persson & Rosenqvist, 2001). The school staff, headed by the principal, has a special responsibility. The values emanating from the staff are of decisive importance if the mission "a school for everyone" is to succeed. A clear allocation of responsibility is also desirable, where one among the personnel bears the main responsibility for the individually integrated children. In some schools there are "picked troops" who more than other colleagues look after any ethical questions that the integration may give rise to. These "bearers of norms" are very important and it is indeed of considerable value if these persons exert a tangible influence on the school activities as a whole, thus imprinting their attitudes in a positive direction (Karlsudd, 1999). The lack of special needs teachers is common to all project schools. It is not unusual for compulsory school teachers to have the direct responsibility for children with special needs, while a special needs teacher retains the formal responsibility. A relatively common way of working with special needs education is, as one participant put it, "the teacher works in the main furrow and the assistants pick up the children who have gone astray". There are teachers who think that children who are not in the normal sphere, as defined by the school in different ways, do not belong to their area of work and competence. In some schools it is therefore very carefully stressed that the pupil assistants do not have a pedagogical function but are there more to give the children support, so that the compulsory school teacher will not relinquish his or her responsibility for this group of pupils. Personnel at schools with individually integrated children have the possibility to consult supervisors from the special school. Supervision is given to the extent determined by coordinators in consultation with the principals concerned. It is special needs teachers with a great deal of experience who give this support to the schools throughout the municipality. The supervision differs depending on the experience and knowledge of the school personnel. For personnel who are inexperienced the supervision is more action-oriented and the special needs teacher focuses on the pupil and method. Inexperienced personnel want supervision in method to get answers to how questions. Oftentimes the personnel at the schools are impatient and, striving to create a favourable environment, want to attain quick results. The personnel want the supervisor to give examples of different models of instruction and many times they place their reliance on various types of teaching aids. Other class teachers place a great deal of responsibility on me. They often say you will fix this! You who are so clever! I sometimes wish we took a greater joint responsibility but we are all so busy. If the personnel are quite experienced and/or the pupil has been in the class for a long time, the supervision has a more process-oriented profile, where the teacher team tests their ideas with the supervisor. Reflecting, supporting and encouraging the personnel are important aspects of the supervisor's work. There is usually a good deal of interest in supervision at the schools. There are also teachers who do without supervision and it can sometimes be difficult to involve the whole personnel. Most, however, consider supervision necessary to make headway in the integration process. Teachers who work with individually integrated children must have the special needs school's goals to be attained in mind. This functions relatively well, but sometimes teachers who do not have the immediate main responsibility for these pupils forget that the goal description differs for this group. Many in the project bear witness to the fact that admission to "junior high school" is a sensitive phase for the children with special needs. They feel that the "junior high tradition" continues to have a strong orientation towards subjects and grades. Some participants are of the opinion that when the child encounters junior high there is a big risk that almost immediately his or her incapacity will be noticed. Until now the teacher had always told the child that he or she was doing well, but now the child meets a different, critical attitude. Here also many pupils discontinue the individually integrated instruction and go over to the segregated groups in the higher level of the special school. Many believe, too, that the other children in a more obvious way grow away from the handicapped children and that the risk for bullying increases during the last three years of the compulsory school period. The children receive a shock. It gets a wrong picture to pubertize from. If you are to learn anything you must be feeling well. Integration is a term that is defined differently depending on which activity is in focus and which persons are engaged in the discussion. The knowledge and values relating to this field vary a great deal at the different schools. Taking our point of departure from the definitions of other researchers, the evaluation of the activities at the project schools has become considerably more significant as the project is underway. When the personnel have a common frame of reference it is easier to evaluate the activities and in the long run increase the possibilities of further integration. What is most important in the work for increased participation is to rid oneself of traditional special teaching and work actively on values, pedagogics and school organizations (Vislie, 2003). The fact that special competence and extra support are as a rule provided for subjects called core subjects is problematical. With a procedure like this the notion is preserved that certain subjects are valued more highly than others. All subjects should be considered important and we should markedly raise our evaluation of the efforts and progress made by the children in these fields. In so-called abstract subjects, e.g. Swedish and math, children with intellectual disability often have the greatest difficulties with the present forms of instruction and grading. For this reason it is essential to give the pupils some responsibility and freedom to choose their own tasks and use their own time. (Christensen & James, 2001). It is remarkable that the overall planning of individual integration is so unstable. The group with the greatest need for stability and continuity is the group that has to encounter short-sighted and temporary solutions. In discussions about integration the allocation of funds is of vital importance. That there is a lack of resources is obvious, but increased resources must in the future be preceded by clearer integration strategies. Perhaps the activities could be developed better if the demand for a clear strategy is tied in with an improved economy. Many times the resources for the so-called normal activities are compared with the resources disposable for the so-called special activities. This comparison is often characterized by competition, which automatically leads to segregation. It is therefore important to create activities that are conceived as a whole and not as two separate systems in the same organization. Small schools with several "stages" and where different personnel categories work together have a good chance to create an environment that includes all the children. Here experiences from different activities and educations can meet. Many times the personnel who have worked with the lower ages have more experience with integration, and hopefully this can be conveyed to those who work with children in the higher ages. Rooms that are used for instruction and working in small groups are often utilized for pupils with learning disabilities. If these rooms are of a high standard a negative status can be avoided. Another possible measure is, to a greater extent, to have the children with normal ability leave the classroom and then meet together with the children with learning disabilities for instruction in a smaller group. This measure would no doubt reduce the risk of the rooms being considered peculiar or special. When it comes to contacts among the pupils themselves, the attitudes of the personnel and the organization of the instruction are of the utmost importance. The more positive learning situations that are created, the greater will be the chance that the pupils will meet in positive situations during the breaks and when school is out. It is also important to allow children in the compulsory school to talk about their experiences of encounters with special-needs children (Whitehurst & Howells, 2006). It is important that the group that often leads the way for the school's development has a tangible responsibility in the work toward an all-inclusive school. The school staff can, to varying degrees of positive branding, stress the urgency of integration goals. Increased time for planning, time for further education, and extra pay are a few examples of how one can call attention to the work as urgent. To guarantee that questions of integration get sufficient scope in the planning, it is appropriate that special needs teachers gain real influence in the group of leaders. All these measures are instances of positive branding that increase the status and value of working with children in need of special support. It is important that everyone in the school feels that he or she is sharing in the progress being made. If all in the personnel group can get supervision and further education, this increases the possibilities. It is also important to find new forms to take advantage of the parents' opinions and ideas. It is remarkable that so many teachers, outside of the project group, are unaware of what policy document is in force for children admitted to the special school. At schools where individual integration has gotten started for the first time, there is a great deal of uncertainty as to how this group of pupils should be received. It is obvious that we need a clear run-through regarding which goal documents and rules govern the activities when children are received in the special school. The requirements of a clearly documented action plan should also be reinforced. It is an obvious fact that there is a sharp boundary line between what is called middle school and junior high. Many times individual integration is discontinued after grade 6, the reason given being that the difference in maturity has now become more obvious. This problem is most likely exaggerated, as the main cause for it is found in the junior high culture that predominates. That junior high pupils on account of greater maturity (age) would find it harder to work together with children from the special school is not likely. That maturity is surely an asset in encountering and understanding friends with handicaps. What is directly decisive is the organization of the instruction and the relation to the pupils on the part of the personnel. When it comes to the teacher's difficulties in laying down goals for the instruction, there should not be so much uncertainty. Individual goals are formulated in cooperation with pupils and parents, and the evaluation that is made after that or the grade that might be given is more a measure of how well the pedagog has succeeded in formulating the goals than how well the pupil has fulfilled them. The goals should be adapted to the pupil's capacity to possibly attain them. It is seldom that the argumentation for integrated activities draws attention to any methodological advantages to reinforce the learning of children in the compulsory school. If it does, it is in fields such as ethics, morals, democracy, etc. When it comes to subjects that have been traditionally highly valued, such as languages and mathematics, there are seldom any arguments given. One argument possibly heard is that children who get to help other children in their learning grow in their own learning. According to the motto "the best way to learn is to teach", pupils who are clever at school could teach pupils who are less adept at school. When it comes to children with special needs, the advantages are more pronounced. Some well-known arguments are that pupils learn from positive role models, they are stimulated by other children who are not handicapped and they are offered challenges. 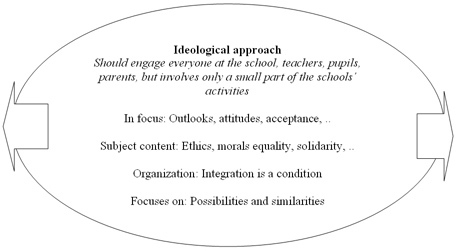 The argumentation regarding integration would do well to collect concrete learning arguments, as the link between ideology and pedagogics to all appearances is not sufficient for the principle of integration to get a foothold. 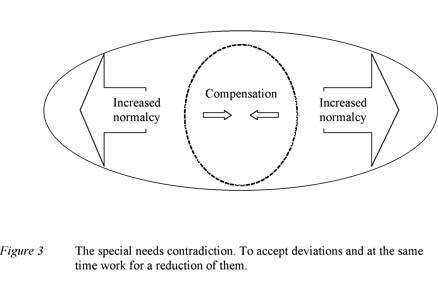 As is evident from an earlier explanation, there are two distinct approaches for special needs work. The first has as its foremost goal helping, by means of compensating measures, the pupil to fit in with the school environment. The other approach works primarily to adapt the environment to the pupil. Both these approaches are in varying degrees represented at every individual project school. In this article I have chosen to call these two tracks the narrow activities (figure 1) and the broad activities (figure 2). It is the narrow effort that has the most significant representation in the school's activities. It is usually carried on in special groups and focuses on, among other things, compensation, methods, skills and often the so-called core subjects that are central to the activities. The instruction concentrates many times on difficulties and deviations and is implemented by a small personnel group, pretty much separated from the rest of the activities (figure 1). The second approach, the broad activities, does not have the same solid foundations at the project schools. It is characterized by a firmly established ideological outlook, where possibilities and similarities are essential and where everyone is committed to the work at the school. The focus is on a common way of relating, distinguished by positive and accepting attitudes toward the group that needs extra support. The content of the instruction affords considerable scope for areas such as ethics, morals, equality and solidarity, which are integrated into the rest of the subjects. In the broad activities integration is a condition (figure 2). The narrow and the broad activities can be conceived of as two opposing approaches: on the one hand to seek compensatory ways to adapt the pupil to the normative milieu that the school represents, at the same time as the goal is to expand the activities and reduce the demands of adaptation. This means accepting a deviation but working toward its reduction. That double message sent during the school's activities is frustrating for many. The narrow compensatory activities must therefore be reduced in their differentiating form and become a part of the broad activities. The compensatory activities must be carried on in an integrated environment but it is important that the compensatory measures do not become too much for the children, a balance must be found between compensating and tolerating (figure 3). It is important to remind ourselves that children admitted to special school are not covered by the normative goals of the compulsory school, but unfortunately by its normative culture. In the project group there have been discussions about the differences between the compulsory school's and the special school's cultures. In the encounter between the two school forms it often happens that the special school's activities have to take second place to the compulsory school's more established activities. The special school has a tradition of encouraging skills that extends beyond the customary school proficiency. A student proficient in the culture of the compulsory school has the ability to use his or her intellectual resources to follow the special codes and norms prevalent there, where memory knowledge is a highly valued capacity. Problem solving is also important but the problems are defined by the school and not by the pupils themselves. Other fields of talent including art, music, handicraft, social competence and other special abilities are not valued as highly. The result is that pupils with special needs have a harder time getting a positive response in a traditional learning environment. The traditional special school has, in the classroom, a more integrative attitude than the compulsory school. The illustration below shows some differences which can explain why the different school forms are difficult to combine (figure 4). As is evident from the report, the compulsory school is not capable of including all children. In this project we have focused on identifying and developing those factors and processes that can build a school for everyone. It is not possible to construct a particular model for this work, but there are important principles that can serve as guidelines. One of these is to get all the personnel involved in the discussion about the policy document and the basic ethical values, and after that every school must find its own strategies and methods. One concrete measure may be to focus on the practical disciplines and encourage those skills that are often marginalized in compulsory school curricula. Using special school curricula in the compulsory school would probably be a radical but effective measure. Increasing the allocation of funds to integrated in relation to segregated activities is another concrete measure which would make an immediate impact. Focusing on education, developmental work, research, conferences and networks is urgent. Rewarding and encouraging schools that purposefully work for integration would give positive signals. A strong and honest support from all levels of the administration is also a condition for the developmental work to succeed, which has been demonstrated by other studies. (Mamlin, 1999; Goransson, 2000). Aiming for increasing integration is not solely a school responsibility but in a very high degree the responsibility of the surrounding community (Carpenter & Shevlin, 2004). To judge a society by studying how it treats citizens who are particularly vulnerable is a good gauge of prosperity and security. The same conditions hold for the "mini-society" that is the school. If children in need of special support can have the benefit of well functioning activities together with the other children, one can have good reason to believe that the pedagogical operations of the school are in satisfactory order. Archer, J.M., Holly, M.L. & Kasten, W.C. (2001) Action Research for Teachers. Upper Saddle River. NJ: Merill/Prentice Hall. Argyris, C., Putnam, R., McLain Smith, D. (1985). Action Science. San Francisco: Jossey Bass. Asmervik, S. (1976). Elever i dina hander: Hur samspelet mellan larare och "problemelev" kan forbattras. Lund: Prisma. Carpenter, B & Shevlin, M. (2004). Creating an Inclusive Curriculum. In Noonan Walsh & H Gash (eds), Lives and Times: Practice, policy and people with disabilities, pp. 81-92. Bray, Co. Wicklow: Rathdown Press. Christensen, P. & James, A. (2001). "What are schools for?" The contemporal experience of children's learning in Northern England. In L. Alanen & B Mayall (Eds): Conceptualizing Child-Adult-Relations, London and New York: Routledge Falmer, s. 70-85. Cohen, L. & Manion L. (1994) Research Methods in Education. 4th edn. London: Routledge. Dalen, M. (1977). Integrering av funksjonshemmede i grunnskolen. Oslo: Universitetsforlaget. Emanuelsson, I. (1996). Integrering-- bevarad normal variation i olikheter. I Rabe, T. & Hill, A. (Red. ), Boken om integrering: Ide, teori, praktik (ss. 9-22). Malmo: Corona. Emanuelsson, I., Persson, B. & Rosenqvist, J. (2001). Forskning inom det specialpedagogiska omrdet - en kunskapsoversikt. Stockholm: Liber. Feldman, A. & Minstrell, J. (2000) 'Action Research as a Research Methodology for the Study of the Teaching and Learning of Science', in A.E. Kelly & R.A. Lesh (eds) Research Design in Mathematics and Science Education, pp. 78-96. London: Lawrence Erlbaum Associates. Goransson, K., Steenson, A.L., Pettersson, L.R., Stenhammar, A.M. & Thorsson, L. (2000). Om alla ar lika skulle det inte vara roligt. : Att bygga en skola. Samverkan mellan sarskola och grundskola. Stockholm: Stiftelsen ala.
Haug, P. (1998). Pedagogiskt dilemma: Specialundervisning. Stockholm: Skolverket. Karlsudd, P. (1999). Sarskolebarn i integrerad skolbarnsomsorg. Malmo: Institutionen for pedagogik, Lararhogskolan i Malmo. Karlsudd, P. (2002). Tillsammans integreringens mojligheter och villkor. Erfarenheter fran ett projekt dar motet mellan sarskola och grundskola fokuserats. Institutionen for Halso- och Beteendevetenskap Hogskolan i Kalmar: Kalmar. Mamlin, N. (1999). Despite Best Intentions: When Inclusion Fails. The Journal of Special Education, Vol 33, No 1, 36-49. Ronnerman, Karin (2003). Action Research: educational tools and the improvement of practice. Educational Action Research (11), 1, 9-21. Scruggs, T.E. & Mastropieri, M.A. (1996). Teacher perceptions of mainstreaming/inclusion, 1958-1995: A research synthesis. Exceptional Children, 63 (1), 58-74. Skolverket. (2001a). Allmanna rad med kommentarer om rutiner for utredning och beslut om mottagande i den obligatoriska sarskolan. Stockholm: Liber Distribution. Skolverket. (2001b). Kvalitet i sarskola-- en fraga om varderingar. Regeringsuppdrag om sarskolan, oktober 2001. Stockholm: Liber Distribution. Soder, M. (1980). School integration of mentally retarded-- analysis of concepts, research and research needs. In NBE. Research and development concerning integration of handicapped pupils into the ordinary school system (pp. 1-30). Starrin, B. (1993). Tillampad socialforskning. I Holmer, J. & Starrin, B. (Red), Deltagarorienterad forskning (ss.11-26). Lund: Studentlitteratur. Stockholm: Skoloverstyrelsen. Tiller, T. (1995). Action Learning and Action Research-- Opportunities and Dilemmas. I Svein & Dowling (Eds). Reflections on Educational Research: The Qualitative Challenge. Landas: Caspar Forlag A/S. Vislie, L. (2003). From integration to Inclusion: Focusing global trends and changes in the western European societies. European Journal of Special Needs Education, 18(1). Whitehurst, T. & Howells, A. (2006). When something is different people fear it: children's perceptions of an arts-based inclusion project. Support for Learning, 21(1). Wilson, B.A. (1999). Inclusion: Empirical guidelines and unanswered questions. Education and Training in Mental Retardation and Developmental Disabilities, 34(2), s 119-133. Wolfensberger, W. (1972). Normalization: The principle of normalization in human services. Toronto: National Institute on Mental Retardation. Dr Karlsudd's research areas are inclusion, special education and flexible learning.